Rough cut cedar on the outside of a home is a beautiful wood product that has a lot of character. It is an extremely popular trim and siding protector for the exterior of many homes. A fresh coat of cedar stain protects the wood and can bring the outside trim or your home’s siding back to life. Cedar is a very porous wood that can often have weathering and pollutants in the nooks and crannies. 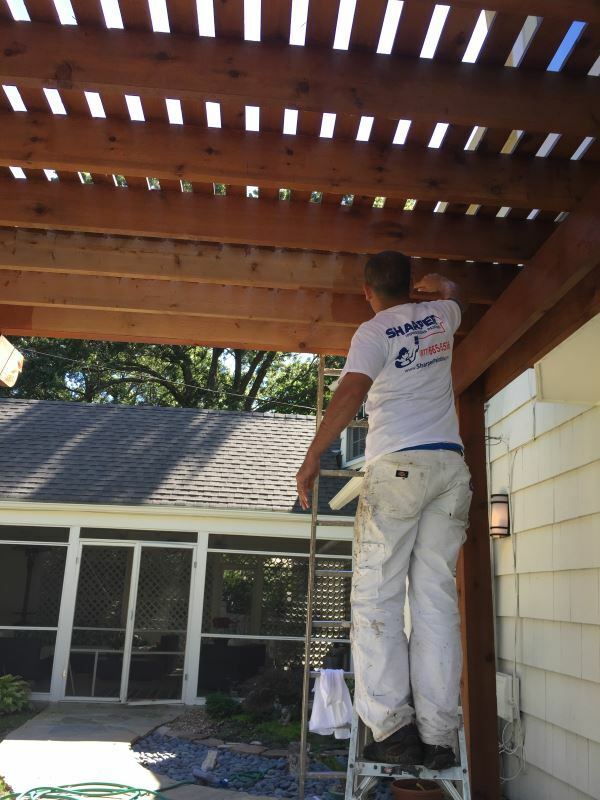 When providing cedar staining services, Sharper Impressions will get all of the prior loose and failing stain off before re-staining the cedar on your home. After the surface is prepped, we apply latex caulk in the gaps and joints to prevent bowing and future cracking in the wood. What Kind of Stain do you Need? Rough cut cedar can be stained with a semi-transparent stain, solid stain or can even be painted with an acrylic latex paint. When you use a solid stain or a latex paint, you can choose any color. However, if you decide on a semi-transparent stain, you don’t have the option to change the color. Rough cut cedar should usually receive two coats of a high-quality paint or stain in order to protect it. You can trust that your cedar stain will last about eight years when properly prepared and applied by the Sharper Impressions team. You may notice a bowing effect to your cedar trim or siding as it starts showing its age from weathering, sunlight, wind and rain. The bowing sometimes leads to cracks or loose boards. It is crucial that a professional painter pounds in loose nails to get the boards back to flush. If the nails pop back out due to a lack of grip behind the cedar board, you would need to use wood screws to make sure the boards are secured to the home. If you don’t know what you’re doing when it comes to home repairs of any sort, a quick fix can easily turn into a much larger or even more dangerous problem. Luckily, Sharper Impressions takes care of all this, giving you peace of mind that your home is being repaired the right way. Our experienced team of painters does the hard work for you, ensuring the safety and durability of your home. Rough cut cedar is a beautiful product, but it does need maintenance. When cedar siding is maintained properly, it should last a long time, retain its color (no matter what color it is) and hold the real natural wood grain look on the outside of your home. Looking for cedar staining services to give your house a fresh look? Call Sharper Impressions Painting today to schedule a free estimate, or request a free quote by filling out the form below!